When I was a child, and even when I was much older, I always wondered why descriptions of airplane flight always required banking as well as the turn of the rudder in order to make a turn. Why couldn't you turn an airplane just like you turn a car or a boat? The descriptions never said why banking was necessary or desirable, and sometimes even people who knew how to fly couldn't give me a simple explanation. Eventually I figured it out, and found sources that were more informative [cf. the Flight Training Handbook, U.S. Department of Transportation, Federal Aviation Administration, Flight Standards Service, 1980]. Turning is a motion, so let me start with the various ways that a body can turn or move. Besides moving in some direction, there are six kinds of intrinsic motion that can affect vehicles. This will mainly mean airplanes and boats, since the motion of a automobile is usually limited by the surface of the road and by the friction of the tires on the road. So here I will just consider airplanes and boats, whose movement is freer. Of the six kinds of motion, three are rotations around an axis, and the other three are motions back and forth along an axis. This means that there are three of each just because there are three axes in three dimensional space. One of the most familiar kinds of rotations in an airplane or boat is the roll, which is a rotation, usually just a partial rotation, around the long (or longitudinal) axis of the vehicle. The rolling of an airplane can be controlled by the ailerons, flaps at the ends of the wings, usually rigged so that if one goes up, the other goes down. The one that goes up will push its wing down, and the one that goes down will push its wing up. This will initiate a roll or bank, which is used for a turn, and other things. Once a roll is initiated, the ailerons must be reversed in order to stop it when desired, since momentum may carry the roll further than one wants. A boat rolls because of wave action, and a stable boat will return to the vertical without anything being done about it (an unstable, boat, of course, will roll over and capsize). Large modern ships (like cruise ships) may have various devices to compensate for and dampen rolls. The diagram shows a cross-section of an airplane and a boat that is perpendicular to the axis of the roll. Motion along the two axes of the diagram illustrate two other kinds of motion. An up and down motion is a heave, a very familiar motion in a boat, since waves lift and drop the boat in turn. A heaving deck can toss people right off a boat. Short bursts of this are also familiar in an airplane, as rough air can raise and drop the airplane sharply. Motion back and forth along the beam or lateral axis of a ship or airplane is a sway. Waves and gusts of air can produce this motion in boats and airplanes, respectively. Rotation around the beam or lateral axis of an airplane or a boat is a pitch. This motion is produced in a boat when waves lift the bow or the stern but leave the other end in a trough between waves. As bow and stern rise and fall in turn, they can travel large vertical distances, tossing people and objects around. If the boat doesn't pitch enough, the bow or stern can even be buried in waves, taking tons of water on board. The pitch of an airplane is controlled by the elevators, usually extensions of the "horizontal stabilizer" in the tail. An airplane is pitched up to increase lift and climb, and pitched down to decrease lift and descend. Of the motions along the other two axes in the diagram, heave is already familiar. Surge is a motion back and forth along the main axis of the vehicles. Waves and air gusts can cause surges in boats and airplanes, though when any kind of vehicle is set into powered motion, it can be said to "surge" forward. The third kind of rotation, a yaw, is around the vertical axis of a boat or an airplane. This will change the direction in which the vehicle is headed. The control surface that initiates a yaw is called a rudder in sea or air craft. Usually this is the only control surface that a boat has, though submarines are the great exception to this, since diving planes control the pitch of a submarine diving or surfacing. The back and forth motions seen in the diagram, surge and sway, have already been encountered. Turning a boat is not too hard to understand. You put over the helm, the rudder rotates, and the boat, as long as it is moving, swings around. You straighten the rudder, and the boat continues in a new direction. The rudder can also be used to correct yaws that are caused by waves or even wind. Turning an airplane is more complicated. It requires the use of other control surfaces, mainly the ailerons as well as the rudder, in order to produce coordinated flight. Why this is necessary becomes more understandable in terms of the errors that result when it is not done properly. Too much rudder and too little aileron produces a skid. Too little rudder and too much aileron produces a slip. Sometimes a slip is desirable, but a skid really never is. What a skid is is already familiar from driving an automobile. If a car is turned too quickly, or just too quickly for the conditions of the road, the wheels can lose traction and the car begins to move sideways. That is probably not where one wants to go in the car, and as long as the wheels do not have traction, the motion of the car is out of control. Since roads are often narrow, a skid can result in the vehicle leaving the road, or encountering another car, both of which are usually very bad. Now, with airplanes, there is never any traction. Nothing on an airplane grips the air the way tires grip the road, which is why airplanes go so much faster than cars or boats -- so little friction. This is why turning the rudder alone to make a turn in an airplane always produces a skid. A yaw just means that the airplane is suddenly flying sideways. Since an airplane is not constructed, aerodynamically, to fly sideways, this is not very good. When the plane is moving sideways, the body of the plane blocks airflow over the trailing wing. So the wing loses lift and begins to drop. This naturally will put the airplane into a bank in the direction of the turn, but it does so at great cost in drag, as the cabin of the airplane takes the force of the airstream. If the airplane is rolled in the direction of the turn, as the rudder yaws the plane around, then the airstream is taken on the wings, where it should be, and the drag is exchanged for lift. The opposite of a skid is slip. If the rudder is not moved at all, but the airplane is put into a bank, then part of the lift of the wings will be offset and push the airplane off in the direction of the bank. The previous forward motion and the new lateral motion will combine to change the direction in which the plane is moving. Unlike the skid, this means that the direction of motion of the airplane actually has changed. So banking all by itself makes a turn in the travel of the airplane. However, just as in a skid, it also means that the plane is again flying sideways, since the rudder has not swung the plane around to face the new direction of motion. But since the tail of an airplane acts like a weathervane, the airplane will tend, as it moves in the new direction, to weathervane around to face that direction. This makes for sloppy motion and excessive drag just as much as with a skid. However, what if one does not really want to head in a new direction, but just to move the plane laterally somewhat (produce a sway)? This can happen when approaching a runway and discovering that the plane isn't lined up quite right. You don't want to go off in a new direction, but you want to move to the right or left slightly. A slip can accomplish that; and so that the plane will not weathervane around into a new direction, the rudder can be turned slightly in the opposite direction, so that the plane will keep pointing correctly, as the bank actually moves the plane over as desired. The purpose of coordinated flight, therefore, is to keep the axis of the airplane smoothly aligned with the direction of motion. This means that the airflow will be past the cabin of the airplane and not into it on one side or the other. That minimizes drag and maximizes lift. However, some lift is necessarily lost in a bank, since part of the force of the lift is offset into lateral motion. To compensate, the plane can be pitched up slightly, increasing the attack of the wings. This can add enough lift to compensate for the lift that now pushes the airplane off in the direction of the bank. The weathervane effect of the tail of an aircraft contributes greatly to the stability of flight. Pitch and yaw cannot go out of control when the horizontal surface of the tail will tend to flatten a plane out and the vertical surface will straighten it out. Stability against rolls can be achieved another way, by building the wings tilted up slightly (a "dihedral" construction, where the planes of which the wings are parts meet at an angle). Thus, when the plane rolls over, one wing will flatten out and produce maximum lift, while the other wing will tilt up even more, losing lift. The dipping wing will therefore tend to lift itself back up, compensating for the roll. In a stable aircraft, the pilot can actually take his hands off the controls and the plane will continue in, or return to, straight and level flight. We might wonder about the stabilizing effect of the tail of an aircraft when it isn't there. When this occurs by accident, as when a tail breaks off, the result is disaster. But it can also occur by design, as in a flying wing. John K. Northrop (1895-1981) developed the first historic flying wings (although the Germans also worked on the concept). 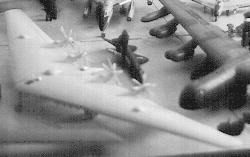 This culminated in two experimental bomber designs, the prop driven XB-35 and the jet driven YB-49. The "X" designation is for experimental aircraft, while the "Y" designation is for a production prototype. A YB-49 crashed on June 5, 1948, killing Captain Glenn Edwards, after whom Edwards Air Force Base (previously Muroc Air Force Base) was then named. Well of course it crashed, you say; it didn't have a tail! How could it be controlled? Well, Northrop had thought of a way to control a flying wing without a rudder or elevators. What he did was split the ailerons, so that one part could go up and the other part down. He called them "elevons." If one elevon was split open but not the other one, this would slow one wing and cause a yaw. If both elevons just opened up or down, this would pitch the wing up or down. They could also be used just like ailerons. In fact, the elevons could be used to control yaw, pitch, and roll all at the same time. So control was not a problem, and for a while it looked like the B-49 would become the Air Force's heavy bomber for the 1950's, which is why the prototypes were built. But if control was not a problem, stability was. There were no surfaces to stabilize pitch and yaw. The pilot would constantly have to be doing that. Robert Cardenas (b.1920), Chief Air Force Test Pilot of the YB-49, said that he had almost lost control of the aircraft while deliberately putting it in a stall -- i.e. pitching up until turbulence on the wings caused a loss of lift. He warned Glenn Edwards about this and later believed that such an effect was why Edwards had crashed. After the crash, it wasn't long before the flying wings were scrapped (literally) and the more conventional B-36 was adopted by the Air Force. But that is nowhere near the end of the story. Eventually, what a tail would not do, and what we don't want a pilot constantly doing, could be done by a computer instead. A flying wing could be given a dynamic stability through electronic monitoring and correction (called "fly by wire"). But why, you might say, would this be good? Well, what Northrop always liked about the flying wing design was that the wing was the airplane. This eliminated superfluous surfaces, and that eliminated drag. The flying wing was "all lift and no drag." That already meant that the B-35 and the B-49 were very fast airplanes. Challenged in 1980 by Ronald Reagan about military preparedness and the discontinuation of the B-1 program, Jimmy Carter answered that there was already a revolutionary new bomber in development, the B-2, which would be invisible to radar. Years went by before the form of the B-2 was revealed to the public. To general astonishment, it turned out to be a flying wing, built by Northrop Aircraft -- and not that different in overall size from the B-35 and B-49. In fact, it was in development well before the death of John Northrop himself, who was informed about the project. It is a shame that he could not have enjoyed public vindication before his death. Afterwards, (now) General Cardenas asked the B-2 test pilots about putting the plane in a stall. They answered that the plane "doesn't let us" put it in a stall. As I have discussed above, anyone, military or civilian, who wants to turn an airplane in flight will use the rudder. If you use only the rudder, you yaw the aircraft and put it into a skid (he uses the right word there); but even military pilots, like my uncle Colonel Dan Hendrix, "don't like the feeling." Since the plane will briefly be flying sideways, which is not very aerodynamic, you will be thrown sideways in your seat. If you are strapped in, you will stay in the seat; but the seat is really designed for your weight to go down, not to the side. These awkward effects would be reproduced, not aleviated, if you "juiced" the engines on one side and powered them down on the other. The plane would still just yaw. So I wonder where Lee Child got these ideas about flying. Perhaps he logged a flight in a real military aircraft, but with a pilot who didn't know how to fly very well -- or who was fooling around. He does not seem to have heard about ailerons or the use of them to bank the aircraft. The plane only "comes around smoothly," as we have seen, in coordinated flight.